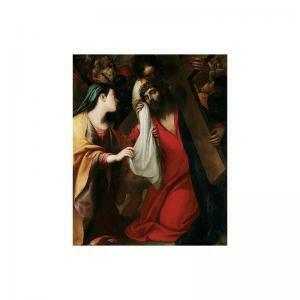 Find artworks, auction results, sale prices and pictures of Pietro Sorri at auctions worldwide. 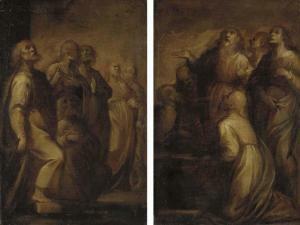 Similar in handling to a number of oil on paper studies by Sorri exhibited in the Palazzo Publico in Siena in 1980 (L'arte a Siena sotto I Medici (1555-1609), nos. 33-4, 39, 41-2). oil on canvas this lot contains 1 item(s). , ed. l. martini, genoa 1983, p. 43, reproduced fig. 14). the attribution to sorri has been confirmed by dr. mary newcome schleier on the basis of a transparency. 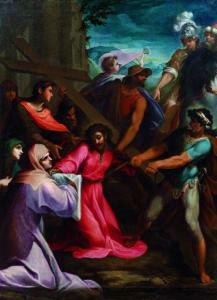 she compares the painting with sorri's circumcision in the pinacoteca in lucca, dated by laura martini to the artist's period in pavia, circa 1599-1600 (see l. martini, in itinerario di pietro sorri (1556-1622), ed. l. martini, genoa 1983, p. 43, reproduced fig. 14). three paintings of this subject are mentioned in a 17th-century list of sorri's works, based on his own ledgers, in the biblioteca comunale, siena (miscellanea, vol. xxii, ms. p.iii.51, cc. 377r-389v; see l. martini, op. cit., pp. 7-23). those painted for the capuchin convent and for the church of santa marta, siena, are still in situ (ibid., p. 18, c.384v, p. 40, reproduced fig. 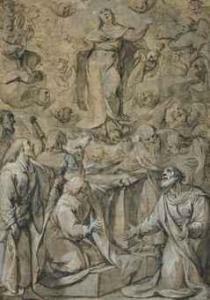 29; and p. 19, c.386r, p. 41, reproduced fig. 32 respectively). the present picture may possibly be identifiable with that listed on c.382v as \\`\\`a messer fausto ghibellini un cristo, che porta la croce con s. veronica' (ibid., p. 13). 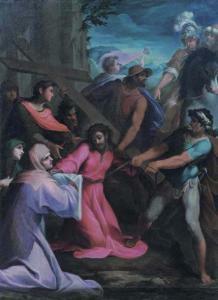 provenance:possibly commissioned by messer fausto ghibellini (see above); cavalcabó collection, rome, in the 19th century; thence by inheritance until acquired by the present owner in 2000.